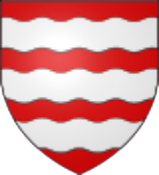 The city took its expansion under Henri IV with the construction of the « Loyre in Seyne » channel that will become the Briare canal. 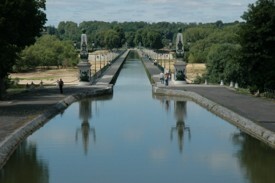 This channel was built between 1604 and 1641, connects the Loire to the Seine River, and employed more than 6,000 men in its construction. Town Centre, the pleasure Port, labeled "Blue flag", has a pleasant walk that evokes the holiday. The Town Hall is a former feudal castle transformed during the Renaissance period and again in the 18th century. Built between 1890 and 1895, in romanesque-byzantine style, St-Etienne’s church is listed in the complementary classification of Historic Monuments. The front (pediment and frieze) is decorated with enamels and the floor is entirely covered with symbolic designs made of mosaics made by the Manufacture des Emaux, in Briare, which give the church outstanding features. Rivotte farm used to rear dairy cattle, and in the second half of the 19th century the casein extracted from the milk was used in the production process to make enamel buttons at the Bapterosses Manufacture. 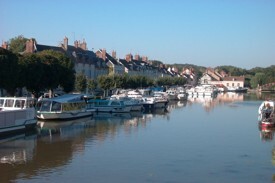 Musée des Deux Marines et du Pont Canal : This visit offers an unusual vision of the world of inland navigation and boatmen of the Loire and canals. 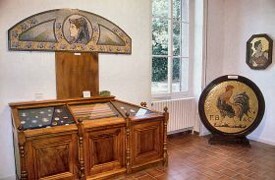 A vast collection of objects takes us through a variety of themes based on the history, economics, techniques and industries related to waterways. Monday to Thursday : from 8:30 am to 12 pm and from 1 : 30 pm to 6 pm, Friday from 8:30 am to 12 pm and from 1 : 30 pm to 5 pm.